According to the well known SECI model, knowledge creation is a continuous and dynamic interaction between tacit and explicit knowledge. This interaction is shaped by shifts between different modes of knowledge conversion involving actors and services in a facility or livelihood. It starts from "Socialization," when the actors are interacting and use services, gaining experience. During "Externalisation" or articulation, the knowledge is made explicit, for example in drawings, models, their evaluations, etc. This is followed by the "Combination" step during which explicit knowledge is converted into more complex sets of explicit knowledge, for example in plans, reports, work instructions. The "Internalization" converts the actors’ explicit knowledge into the actors’ tacit knowledge. Then the process starts again with socialization and so on. Thus the knowledge creation happens continuously as part of a cognitive self-transformation. It also happens in multiple concurrently operating teams or groups. The figure below represents both the operations of the actors involving the facility or livelihood (Arrow A) and the self-transformation (B) in which the team or group abandons obsolete knowledge and learns to create new things, improves its activities and deploys new tools and services (Arrow A’). The circular B arrow applies the SECI modes of knowledge conversion. A Scientist may be tempted to recommend an intervention in a system, on the basis of "scientific knowledge1" on one or a few factors at play in the system. In collective action (and reflection) systems, the conditionality of collective-action theoretical predictions necessitates a careful analysis of the socio-technical system of interest, as a problem-situation is articulated, a hypothetical solution is invented or found, the evidence of the intervention is constructed, and the intervention is implemented in practice. In multi-level socio-technical systems, an intervention might consist of multiple components influencing outcomes via various underlying mechanisms. Such complex interventions receive little interest from scientists. The temptations of the presumptive mindset can be prevented by giving proper attention to diagnostics prior to the therapeutics. The conversion of (development economics) knowledge at the macro level has only been partially successful. Rodrik  elaborates this point by listing past and ongoing initiatives and successes and the ideas that have been motivating them. Therapeutic options will often involve an innovation for the benefiting socio-technical system. Such innovations can be of different types: incremental, architectural, modular or radical. This is explained in the following chapter which also introduces the term dominant design. Some of the externalized knowledge is architectural knowledge. Is there a way of separating externalized architectural knowledge from situational knowledge on components with their sizes, and interactions with their rates and performances? Incremental: an established design is reinforced by improving individual components. Architectural: the way in which the components of an artefact are linked together changes, while leaving untouched the core design concepts and the basic knowledge underlying the components. Modular: only the core design concepts of a technology are changed, not the linkages. Radical: a new dominant design is established with a new set of core design concepts embodied in components that are linked together in a new architecture. A dominant design is externalized architectural knowledge, in the knowledge conversion process, its articulation ends a period of experimentation and confusion. A dominant design is characterized by a set of core design concepts that correspond to the major functions performed by an artefact, as embodied in components, and by an architecture that defines the ways in which these components are integrated (interact). It incorporates a range of basic choices that are not revisited in every subsequent design. Once a dominant design has emerged, new component knowledge becomes more valuable to the firms than new architectural knowledge, which appears relatively stable. Each type of innovation has implications for the knowledge conversion practises, and for the division of industries and externalized knowledge that is key to progress. Nonaka & Konno  describe the Japanese word Ba as the world where the individual realizes himself as part of the environment on which his life depends. These authors illustrate the Ba concept in reference to the SECI model, there is a different type of Ba for each knowledge conversion mode, and they illustrate Ba's transformation in companies. Bringing in also the macro, meso, micro and pico classification (in the social architecture), Ba's transformation in companies is transformation of the "micro ba." In multi-level socio-technical systems, also transformations of the sectoral environment, the "meso ba," and of the overall landscape, the "macro ba," are feasible. entrenched practice patterns (hampering change) are often diagnosed as exogenous binding factors for one actor (pico or micro level) that appear to be choice factors for another actor (meso or macro level). Proven pertinent to enterprise architecture induced by information systems , the types of innovation allow us to distinguish intervention options of each of the actors in their socio-technical interactions. Mono- or cross-level occurrence of these innovation types further differentiates architectural and radical types of innovation. In mono-level architectural innovation the changes in the linkages among components (and principals owning or exchanging them) would happen within a single level, for instance by drawing up a new supply chain structure for a given product platform, or by defining a new auctioning or regulatory mechanism. The emergence of a radically new socio-technical regime within a given landscape illustrates mono-level radical innovation. An example is the British transition from sailing ships to steamships (1840-1920) . If a transition includes the creation of new entities at another level that interact according to patterns known from other socio-technical regimes, then we could refer to it as a cross-level architectural innovation. In cross-level radical innovation, new types of cross-level interactions would coincide with radical innovation at more than one level. By considering multiple actors at multiple levels, an extended, yet disciplined, socio-technical design space is exposed where interfaces facilitate impact projections, as exogenous factors for one actor appear to be choice factors for another actor. By exposing such relationships, the collective regulative bundle (CRB) methodogy inherits and reinforces the benefit of Institution Analysis and Design (IAD) that it can lead one out of the path dependency of existing patterns of practice when their accompanying ways of thinking have not yielded solutions (Oakerson (1978) cited by ). The facility-focused and livelihood-focused knowledge-conversion processes of different actors (at socio-technical levels pico, micro, meso and macro) interact according to market and non-market mechanisms. These mechanisms embody rules and norms that exist in a socio-economic environment with evolving institutions and infrastructures. Market mechanisms enable socio-economic progress by a progressive division and specialisation of industries, including the knowledge conversions. The division of labour is inherently connected to characteristics of the market and the goods, including the market's extent, institutions and infrastructures. 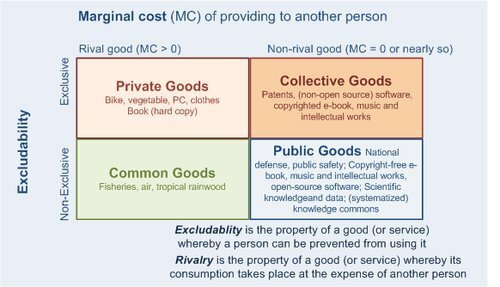 What is the suitable unit of externalised knowledge for trading and combining it, and for awarding intellectual property? Is it a scientific paper, a book, a patent (as we know it, in some jurisdictions without a precise scope defined), a performance indicator, a photograph, a problem and its solution, or what else? Referring to the definition of infrastructure resources in Convention on Knowledge Commons, Art. 2 Use of Terms, which part of the externalized knowledge must be considered infrastructure resources? How must one cope with the combination of knowledge commons as part of commercial knowledge products? What forms of combination do add genuine value? And what is a fair price for such combinations? Are combinations that "hide" the commons status of some of the content legitimate and fair? The embodiment of much externalized knowledge as printed matter, in combination with ICT-enabled efficient means for content re-ordening and mark-up, implies opportunistic and wasteful publishing and authoring attitudes. Should and can we discipline such unsustainable knowledge-conversion aberrations (with dramatic consequences for people at the base of the pyramid, and for the environment)? In spite of their merrits, growing volumes of scientific papers, reports, books and comparable knowledge carriers, and the expanding patent scope in poorly-governed patent systems present growing hurdles in the progressive division and specialisation in the knowledge industries. The wasteful over-supply of some knowledge products is increasingly driven by publishers' profit focus and/or authors' reputation and job-security focus. To become more fit for the facility or livelihood in which many knowledge consumers dwell, on-demand configurable knowledge products must built upon much smaller units of externalized knowledge. Their provide is still being neglected. A novel institutional instruments to govern their consolidation and supply is being pursued by the Convention on Knowledge Commons. Poor definition of the scope of patents encourages opportunistic bundling/umbrella patents (abstract patents) that aim for the control of common combinatory actions applied to genuine innovations (see for instance US patent application publication no. 2009/0177569 (http://www.ip-watch.org/weblog/wp-content/uploads/2009/11/us29177569a11.pdf). A more precise answer to the second question will emerge during the drafting of the Convention on Knowledge Commons. Candidates include externalized knowledge that is part of national curricula, all knowledge products for which the intellectual property monopoly has expired, and structuring principles for ensuring access to systematized knowledge. Combination becomes increasingly a mechanistic activity, that, with the support of ICT tools and repository services, can increasingly be provided also by smallholders such as teachers and the learners themselves, the owners, managers and workers at facilities, and persons in their livelihoods. These actors should be empowered to perform required externalizations and combinations themselves, especially where knowledge commons are involved. The Convention on Knowledge Commons can become an instrument in the disciplining of opportunistic and wasteful publishing and authoring attitudes, and in the prevention of opportunistic bundling/umbrella patents. Opportunistic publishing practices could be addressed by a publishers code of conduct. Interaction between actors (of all levels) involve the fund and flow of the well known resources: material, money and content. For common transactions, customary and regulatory institutions help to keep transaction costs low. Development initiatives have high transaction costs, more so when agreements or standards concerning the roles and scope of participants are lacking. On the other hand, a centralized setting of detailed rules of the game is unfeasible. Also the socio-diversity, the ferment in several sectors and in information technology are driving complexity and risks for initiatives, and so are (intellectual) property regimes and commercial interests. Several studies and observations confirm the lack of effectiveness, efficiency and expressiveness in current development assistance <citeulike: aid-effectiveness>. addresses in somewhat more detail the knowledge market failure, its implication for smallholders, and what fit institutions could do about it. Financial and knowledge resources are two kinds of indispensable "general purpose" resources in interactions, including development assistance. Financial means are hardly available to smallholders in general, and they are in short supply in low-income countries. With material resources such as food, energy and construction materials, money shares the rivalry property : money can only be spent once. The money supply problem is addressed by innovative financial solutions such as micro-credit, micro-insurance and micro-savings for which CGAP Consultative Group to Assist the Poor provides market intelligence, promotes standards, develops innovative solutions and offers advisory services to governments, microfinance providers, donors, and investors. Some of its publications are at <citeulike: financial>). Knowledge on the other hand is a resource that is non-rivalrous. This opens up opportunities for “economies of reuse”: Externalized knowledge (content in context) provided via open shared services can be reused innumerable times at no or minute additional cost. Yet, such opportunities are hardly explored. The global community can gain much from better seizing the content reuse opportunities. For development initiatives it is important to avoid (too much) duplication of effort. Collectively, initiatives had better meet the MECE criterion: ensure that their content is Mutually Exclusive and Collectively Exhaustive, as explained at Initiative Management. Smart content provides an easy-to-use approach to achieve better content reuse and reduce the cost of knowledge conversions in development. 7. Nonaka, I., Toyama, R., Konno, N., February 2000. SECI, ba and leadership: a unified model of dynamic knowledge creation. Long Range Planning 33 (1), 5–34. 9. Ostrom, E. and Hess, C., 2007 A Framework for Analyzing the Knowledge Commons. In: Understanding Knowledge as a Commons – From Theory to Practice, Hess, C. and Ostrom E. (eds. ), The MIT Press, Cambridge, Massachusetts, 2007. 10. Rodrik, D., December 2009. Diagnostics before prescription. 1. Positivistic research methods focus on discovering quantifiable causal relationships between measureable factors.